Welcome to DAY SEVEN of 12 days of giveaways! 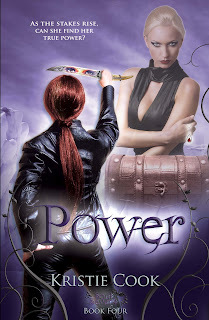 As the stakes rise, can she find her true power? As the Amadis prepare for war, Alexis returns to Florida with orders to relax, regenerate and replenish her depleted power. But her task list quickly grows—establish a new safe house, learn the art of conversion, find her AWOL protector, help a desperate fan, and protect her son. Oh, and figure out what’s going on with her husband, whose peculiar behavior just might get them killed. I have not read anything by Kristie Cook yet. Something to look forward to. Is this part of a series? I notice all her book names sound very familiar. For that reason, I chose 'Promise' as the book I want to read. It was the first listed in the series of ebooks available to win. I'm really interested in getting Power! Thanks and Happy Holidays!